CRM and Project Management Software from MaxCon is a great way to put systems and processes in place that help you run a better business more effectively and efficiently. Here are 3 surefire ways you can use MaxCon to make your business run better, so you can focus on building your business, not just fighting fires. Tired of walls covered with whiteboards, stacks of papers and countless Excel files being passed back and forth? MaxCon helps organize your business and takes the pain and paper out of running a successful construction company. Every day, we talk to contractors who are using technology to organize their business, leaving more time to focus on boosting sales. 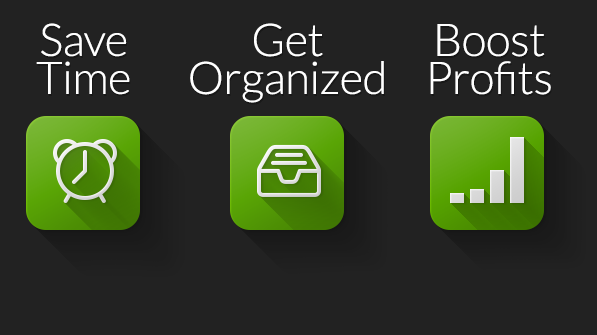 Organization also decreases wasted staff time and helps you increase profits with no more work. For contractors who want to grow their business, getting the whole team on the same page is critically important. From marketing, to sales, project management, installation and customer service, having one system that everyone uses and is accountable to, is crucial. Using MaxCon’s CRM and Project Management system makes it easier than ever to track leads, sales, orders, projects and collections. MaxCon gives your whole team anytime, anywhere access to your data so it’s easy to keep everyone working together on the same page. By creating systems and processes in your business, you’ll find you have a lot more free time to focus on more important things. The key to creating systems is to write down how you do things and streamline your processes for maximum effectiveness. Having a good technology platform makes identifying and implementing good systems and processes much easier. MaxCon helps simplify your life with tools to manage leads, track sales, and manage more projects. The key to success is working smarter, not just harder.